McGee has been one of the stars of the NBA postseason with his athletic play on both ends of the court, catching the attention of fans and media alike. The 7-foot, 250-pound journeyman center has caught pretty alley-oops high above the rim. He once joined Warriors guard Stephen Curry in successfully trapping Portland Trail Blazers guard Damian Lillard during their first-round series. And McGee’s King Kong-like swats have made him a defensive force similar to shot-blockers Rudy Gobert and DeAndre Jordan. It wasn’t long ago that there was plenty of room on McGee’s bandwagon. The free-agent pickings at center in late July 2016 were J.J. Evans slim. The Warriors were in desperate need of a rim protector after the departures of Andrew Bogut (trade) and Festus Ezeli (free agency). One of the remaining options was the injury-riddled McGee, a nine-year NBA veteran who averaged 5.1 points and 3.9 rebounds in 10.9 minutes per game for the Dallas Mavericks during the 2015-16 season. He had also played with the Washington Wizards, Denver Nuggets and Philadelphia 76ers. To McGee’s chagrin, the Flint, Michigan, native was most famous for being a regular on Shaquille O’Neal’s television segment, Shaqtin’ a Fool, after making mistakes on the court. The segment led to a Twitter feud between the two this past season. “I’ve had this same stigma on me as a player that has had cases in court,” McGee said. “I have the perception of being a distraction on and off the court for some reason. I haven’t done [anything]. Nothing at all. I have the same perception of guys doing bad stuff, getting DUIs and things like that. I have nothing like that. 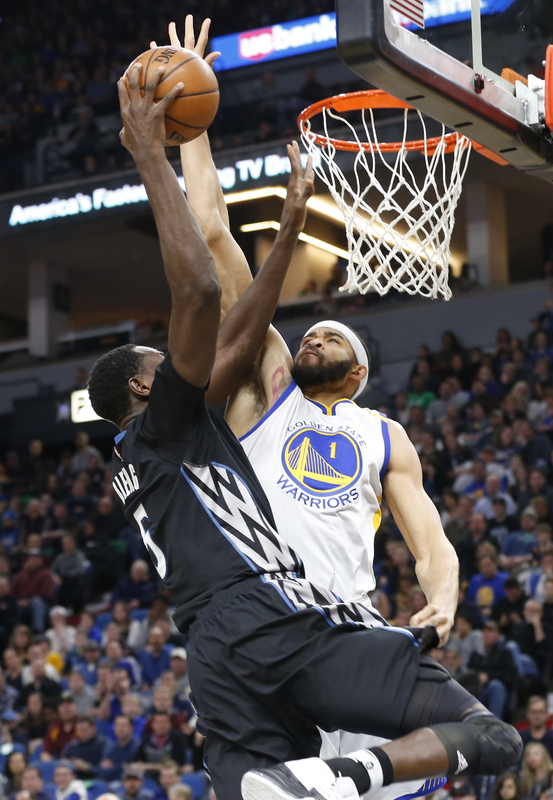 Minnesota Timberwolves’ Gorgui Dieng of Senegal shoots as Golden State Warriors’ JaVale McGee,right, defends during the first half of an NBA basketball game Friday, March 10, 2017, in Minneapolis. Who is the real McGee? Agent B.J. Armstrong said his 29-year-old client might appear to be a tough guy, but he actually is a nerd at heart who loves computers, gadgets and film. McGee hails from a basketball family: His 6-foot-10 father, George Montgomery, was a 1985 second-round draft selection by the Portland Trail Blazers, and his mother is former WNBA star Pam McGee. JaVale McGee has a Pro-Am basketball team in Los Angeles’ famed Drew League that advanced to the league’s finals. McGee has his own nonprofit organization called #JUGLIFE, which offers a challenge to drink a gallon of water a day. Co-founded by McGee and Kez Reed in December 2013, the goal of the foundation is to increase awareness of the importance of drinking water daily for healthy living. #JUGLIFE also has built wells in Matugga, Uganda, to provide clean water to a school with more than 500 children. “Water is the most important thing in the world, to tell the truth,” said McGee. “I started drinking jugs of water in Denver. I was reading up on hydration and the benefits. I started drinking a gallon a day and writing on the [container] and putting a picture on Twitter. People starting hashtagging me back, ‘Jug Life,’ because that’s what I wrote on the bottle. McGee said he received contract offers from two of the 30 NBA teams and an offer to play in China that he seriously considered. A non-playoff NBA team that McGee didn’t identify offered a guaranteed contract. The other NBA offer was from the Warriors, who offered a non-guaranteed contract paying a veteran’s minimum salary of $1.4 million. Warriors general manager Bob Myers heard nothing but positive news when he did his background work on McGee, which included talking to Warriors forward Andre Iguodala, McGee’s ex-Nuggets teammate. Armstrong said Warriors coach Steve Kerr was a fan of McGee’s and had a vision of how his rim protection and athleticism could help ease the loss of Bogut. Despite the non-guaranteed contract, the prospect of playing in the NBA Finals was too intriguing for McGee to pass on. McGee quickly showed he could be a rim-protecting force. On the first day of Warriors camp, Durant told reporters that McGee ran him down and blocked his shot from behind. McGee said he blocked six shots in the first practice. He also had three blocks in 16 minutes in the Warriors’ preseason opener against the Toronto Raptors. He said the Warriors figured out quickly how to use him offensively by way of the alley-oop pass. The Warriors had several center options in newcomer starter Zaza Pachulia, veterans David West and Anderson Varejao, James Michael McAdoo, Kevon Looney and rookie Damian Jones. But none offered the athleticism on both ends that McGee did. McGee received “did not play/coach’s decision” status four times and played double-digit minutes just once in the first 13 regular-season games. By late November, Kerr appeared to be growing more confident in using McGee. McGee eventually locked in the second center role behind Pachulia, which made it easier for the Warriors to eventually waive Varejao. McGee saved his best month for April, averaging 10.3 points on 79.4 percent shooting from the field, 4.8 rebounds and 1.5 blocks in 13.5 minutes per game. For the season, the former Nevada star averaged 6.1 points on a career-best 65.2 percent shooting from the field and 3.2 rebounds in 9.6 minutes per game. His 77 games played were also his most since appearing in 79 during the 2012-13 season. McGee’s blocks and dunks have been a regular on highlight reels of late. Durant added that McGee can catch an alley-oop just above the square on the backboard. 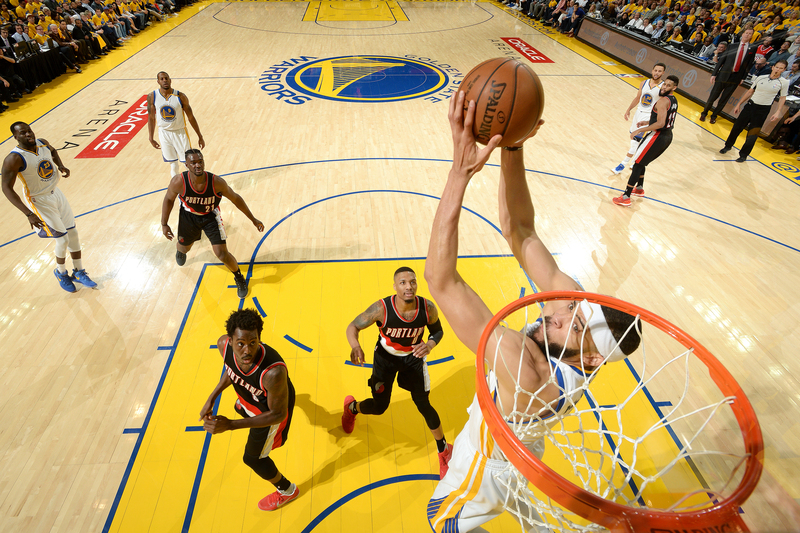 JaVale McGee #1 of the Golden State Warriors goes for a dunk during the game against the Portland Trail Blazers during Game Two of the Western Conference Quarterfinals during the 2017 NBA Playoffs on April 19, 2017 at ORACLE Arena in Oakland, California. McGee continued to blossom once the playoffs arrived. He ranks second in field goal percentage with a dominant 78.3 percent. He’s fourth in blocks with 2.3 in 12.1 minutes per game. In Game 2 of the first-round series against Portland, McGee had 15 points, making all seven field goal attempts, five rebounds, one steal and four blocks in 13 minutes off the bench. He became the first player to record at least 15 points and four blocks in under 15 minutes in a playoff game, according to the Elias Sports Bureau. McGee was confident he could play this way if given a chance. When the Warriors swept the Blazers, McGee advanced past the first round of the playoffs for the first time. He can’t help but notice reminders of the Warriors’ 2015 NBA title when he walks into their practice facility and sees the celebratory murals on the wall. And if the Warriors are to win their second title in three years, McGee could bring his bandwagon to the celebration parade.